Mini mobile concrete batching plant is similar with other concrete mixing plant. This plant is suitable for small and medium-sized construction sites. Then, we will talk about the features of mini concrete batching plant. It is PC+PLC control that can vividly display the production process on the screen. The operator can monitor whole process all the time. The scale board and mixing blades of the mixer are made of wear resistant alloy. And it has special shaft end seal and longer service life. Screw conveyor is a new type of transporting equipment, which use rotary screw vane to push material continuously in closed housing with round section. The silo can be used to store materials such as cement, coal ash and other kinds of powder as a main part of concrete batching plant. 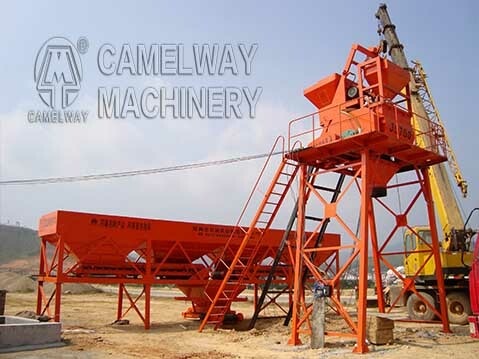 Zhengzhou CamelWay Machinery manufacture specialized in the production of concrete mixing batching plant for several years. If you are interested in the concrete batching plant, you can contact us at any time. What Are the Requirements of Concrete Batching Plant?